After the installation is complete click “Activate” link (Plugins > Installed Plugins). Upload the plugin folder into /wp-content/plugins directory of your wordpress installation using your favourite FTP client. Navigate to “Plugins” > “Installed Plugins” section in your dashboard and activate the plugin. Go to “Plugins” > “Add New” and press “Upload Plugin” button. More info about plugins installation can be found in WordPress Codex. Wrong permissions set for WordPress files & directories. Not enough memory limit on a webserver. Default Wishlist Name – here you can set what wishlist name the users will see by default. (See image below). Wishlist Page – Wishlist page need to be selected so the plugin knows where it is. This page should have been created upon installation of the plugin, if not you will need to create it manually. Wishlist page is a usual page with wishlist shortcode, so you can add any additional content to this page if you need. Or you can create any page and place wishlist shortcode there. Then simply choose this page as Wishlist page. Remove Product from Wishlist if added to cart – if this option is enabled, the product will be automatically removed from the users wishlist once it is added to cart. Button position – allows you to set position of the “Add to wishlist” button on a single product page. *If you choose “Custom Position with code” option, you will have the ability to add the “Add to wishlist” button using the shortcode anywhere in a product content section. You can also put this shortcode at any page/post of your website. You will need to add your product ID and Variation ID for variable products. To find the ID head to Products in your admin panel and then hover over the product you need the ID for. You’ll see the product ID number right there. “Add to Wishlist” Icon – here you can enable/disable the icon before the “Add to wishlist” button or even upload your custom icon. Icon will be scaled to 14×14 px. Using the icons with larger dimensions may require additional styling to fit the button. “Add to Wishlist” Text – you can change add to wishlist button text here. When you click Add to Wishlist button a popup with success or error message appears. You can adjust message and buttons text for this popups with following options. “View Wishlist” Text – here you can put your custom text that will be displayed in a popup before and after adding the product into wishlist. “Product already in Wishlist” Text & “Product added to Wishlist” Text – you can adjust success and error message for Add to Wishlist button. * Below you can see images with sample button options variations in admin panel and on frontend. Options below a pretty self-explanatory. They are allowing you to show or hide various columns in wishlist page table. You can choose what kind of information to show in wishlist page table. So you can make your wishlist page simple or informative. You can see screenshots of wishlist table with different product and table settings below. Following settings adds bulk actions and buttons to the footer of the wishlist page table to help your customer manage wishlists with big amount of products easily. Show Checkboxes – this option enables/disables the ability to use multiple actions with products in a wishlist. Show Actions button – enables/disables drop down with bulk actions on the bottom left of the wishlist table. Show “Add Selected to Cart” button & “Add Selected to Cart” Button Text – these options allows you to show/hide this button and also apply custom text. Show “Add All to Cart” button & “Add All to Cart” Button Text – these options allows you to show/hide this button and also apply custom text. Following options enable/disable Social share icons below wishlist table on wishlist page. Wishlist owner can easily share their wishlists using this button on social networks. You can choose between using theme or wishlist custom styles. If you choose to use theme styles only the most important for wishlist styles will be added. If you wish to adjust wishlist appearance from admin panel, you can switch this option to use wishlist styles and over 60 color and style options will be enabled. Not enough style options? You can enable “Template Custom CSS” and add your custom CSS styles directly in admin panel. There are several ways to translate this plugin. We are going to tell you about the most popular ways. Open ti-woocommerce-wishlist-premium.pot file in root of a plugin directory using POEDIT tool. Use search to find strings or words you need to translate and make translation. Save file in your language i.e. ti-woocommerce-wishlist-premium-es_ES.po (Spanish). Navigate to Plugins section in your dashboard and activate the plugin. Activate your language under the Settings -> General section in your admin panel. More info can be found here: Translating With poEdit. 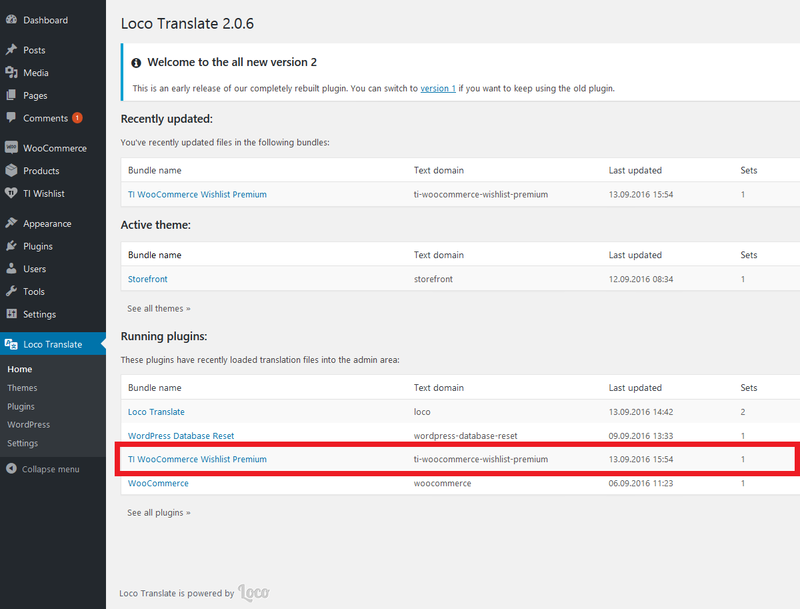 Navigate to Loco Translate -> Home section in your admin panel. Select TI WooCommerce Wishlist Premium in the Running plugins: section. Edit existing file or add the necessary language (new). More info can be found here: Loco Translate. Navigate to WPML section in your admin panel and use the Setup Wizard. Check the documentation on how to use this plugin: WPML Translate.